If you’re the kind of traveler that prefers to get covered in mud racing an ATV through the rainforest or getting launched across a canyon with nothing but a metal wire and safety harness between you and the forest floor, a zipline adventure in Costa Rica’s incredible Monteverde rainforest is just what you need! 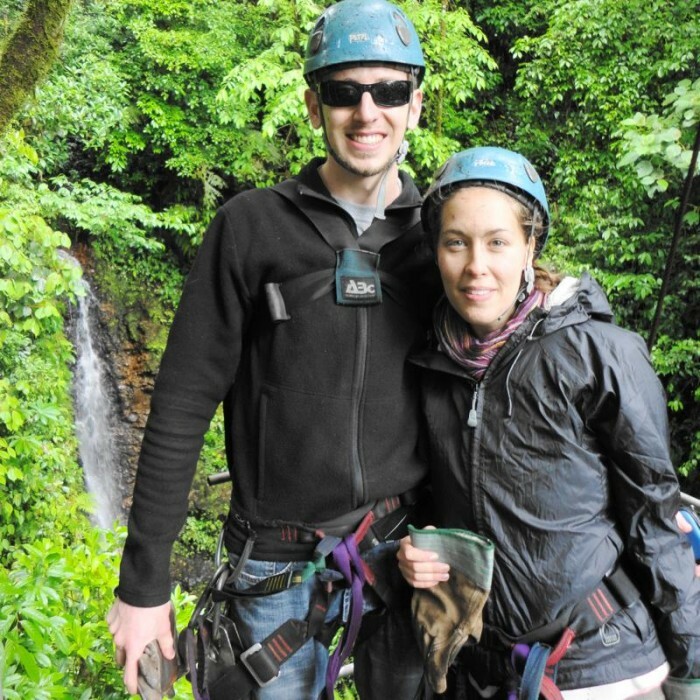 Speaking from experience, my wife and I decided to forgo the typical comfort and luxury of a holiday on the beach for one of extreme adventure and adrenaline-fueled explorations in Costa Rica. As soon as we hit the ground in the capital of San José, we made our way to the mist-shrouded rainforests of Monteverde in search of our first thrilling escapade: the Monteverde Extremo Canopy zipline tour. Let me start by saying that my wife is absolutely terrified of heights. Along with killer bees, squirrels and microwaves, ziplining was definitely on her list of things that scared her. I was assuming that I would be going on this trek by myself while my wife stayed behind and quietly encouraged my behavior from afar, but when we actually arrived, she surprised me by grabbing a harness and suiting up! In order to get there, I would highly recommend arranging pick-up from the company directly. They will get you, drive you up the winding dirt road way up into the clouds where the tour seems to start, then drop you and your kids (if you bring them) back off at your hotel – for free (assuming you make it back alive. I did!). This particular zipline canopy tour is known for being extreme. It’s in the name! While it is certainly family-friendly, it is also not for everyone. For example, on the last (and longest) zipline, you have the option of going Superman-style, also known as facing the ground with your feet behind you (which I would highly recommend, if you have a death wish like me). I opted for this extra bit of lunacy, and it was definitely one of the scariest things I’ve ever done. I would do it again in a heartbeat, too! Although we didn’t know it at the time, the next three hours of our lives would put us both to the test, mentally and physically. Mountains would be conquered, tears would be shed, and there would definitely be more than a fair share of screaming, too. The adventure began with a long, arduous hike up the slippery slopes of what I call Zipline Mountain #1. We discovered that when trekking in a rainforest, things are wet and very slick. I slipped and fell onto my face multiple times, each time coming up to the sounds of my wife laughing at me while being absolutely covered in mud. Throughout our daring escapade, we hiked a total of 2.8 kilometers past raging waterfalls, learned swear words in 4 different languages (thanks to our diverse group of fellow explorers) and thrust ourselves across 21 different ziplines that reached dizzying heights of over 450 feet and 2550 feet in length. I don’t know how my wife managed to do it, but she soldiered on through every single obstacle (except the Tarzan swing, that was just too crazy!) with a nervous – but present – smile on her face. Let her be an inspiration for you if you are scared of heights and never thought you could do something like this. You can! When planning a trip that includes ziplining in the rainforest, I would highly recommend bringing a few critical items. One, make sure you have a breathable light rain jacket (men, women). There is nothing more miserable than being soaking wet and cold, so definitely don’t skimp on this one. Second – a good pair of light waterproof hiking shoes (men, women) that have plenty of grip, paired with trekking socks that will keep your wet feet warm. Like mentioned previously, the rainforest is just too wet and slippery for any old footwear. Next, make sure you have some high DEET insect repellent spray, sunblock, antiseptic wipes (in case you get a cut), a waterproof bags for your documents and sensitive electronics (you don’t want those getting soaked). And of course a camera or if you have the luxury of a GoPro with a head or chest mount – bring it! You will get some incredible footage that you’ll want to watch over and over for years to come. Finally, bring a daypack for all those items and a change of underwear. When you’re dangling 400 feet above the canyon floor Superman-style and the cows look as small as ants, you’re going to need them.